In an ant colony, every ant has their job to do according to their caste. The queens make babies, the soldiers defend the nest, the workers forage for food (or steal it), and some ants, mysteriously, work at nothing all day. In some species, the different castes even have different body types and sets of behaviors that help them do their jobs, and they cooperate to keep the colony humming along smoothly and to ensure the survival of the whole group. Their intense collectivism allows them to build rafts made of themselves and flow like ketchup as if transitioning between solid and liquid states. It’s a way of life that’s led scientists to think of ant colonies and other insect societies as “superorganisms” instead of just groups of individuals living together. The different ants and castes are less like people in a city and more like the cells and organs in a body. Biologist Thomas O’Shea-Wheller’s recent research, published in PLOS ONE, shows that ant colonies well deserve that nickname, reacting to threats “much like a single organism would in response to attacks on different parts of its body,” he writes. The team collected 30 ant colonies from a quarry in Dorset, England, and transferred them to their lab. 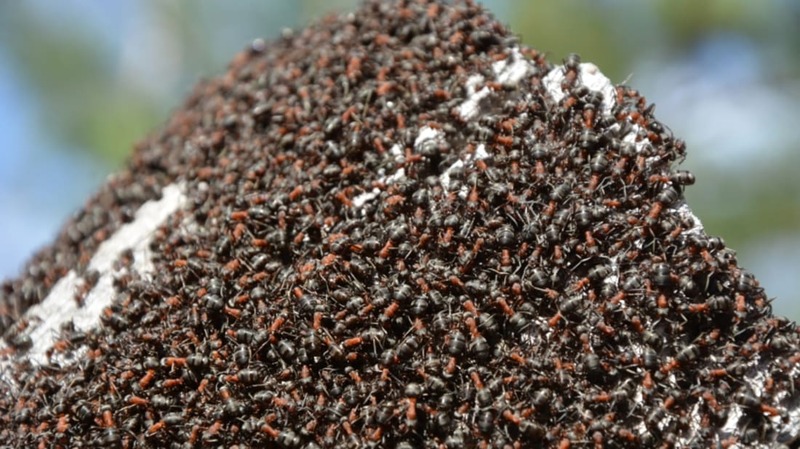 Once the ants were settled into their new homes, the researchers simulated predator attacks by scooping up certain worker ants with a tiny brush and removing them from the colonies. In some attacks, they removed scouts that were leaving the nests or walking around the periphery, while in others they pulled the tops off the nests and kidnapped ants from their centers. The colonies responded differently to the various types of attacks. When scouts were removed, other ants retreated inside the nest and the colony slowed or stopped the exit of new scouts. The reaction is similar to the withdrawal reflex a single organism might show in response to injuring a limb, the researchers say. Meanwhile, when ants were removed from the center of the nest, the whole colony picked up and moved out, coordinating a mass evacuation of the nest and moving to a new one—all while protecting the queen, eggs, and larvae. In both of these situations, the ants reacted collectively to the loss of just a few workers in ways that were specific to the location of the attacks. In other words, they dealt with injuries to their "extremities" and their "heart" in different ways.